I have been riding in a Freeform since 2006. I got a little half Arab mare named Mo (Domino’s Wildflower) who was to become the best horse I’ve ever owned, but the beginning was very rocky in so many ways. She was 4 or 5 years old, completely wild, and very emotional about everything when I got her, the quintessential chestnut Arabian mare. Training a wild horse was nothing new to me, but I could tell by how her top line was developing, that the saddle wasn’t doing her any favors. Fortunately, I did TONS of ground work and she proved to be kind and willing, so I had time to find the right saddle. I think I tried 10 different saddles: hunt seat, dressage, western, trail, you name it, before an endurance friend recommended the Freeform. After some research, I decide to make the investment. It was some of the best money I’ve ever spent! Remember I said Mo was emotional? Well, she would definitely talk to you if she was not happy. But because I did so much ground work, and I was taking it slowly, she was always polite when she complained. But she would knock rails down when jumping, she would not stride out on the trail and she would trot with her ears back, head high, and back shallow so sitting her trot was impossible. And it is never fun riding a grumpy horse. But I remember the first time I put the Freeform on her. She definitely was more forward on the trail, and jumped the fallen tree with forward ears and a rounded back. The second time I rode her in it, when I asked her to trot, she gave a big sigh, dropped her head and shuffled off happily. And I was sitting!! I never rode her again in a different saddle. 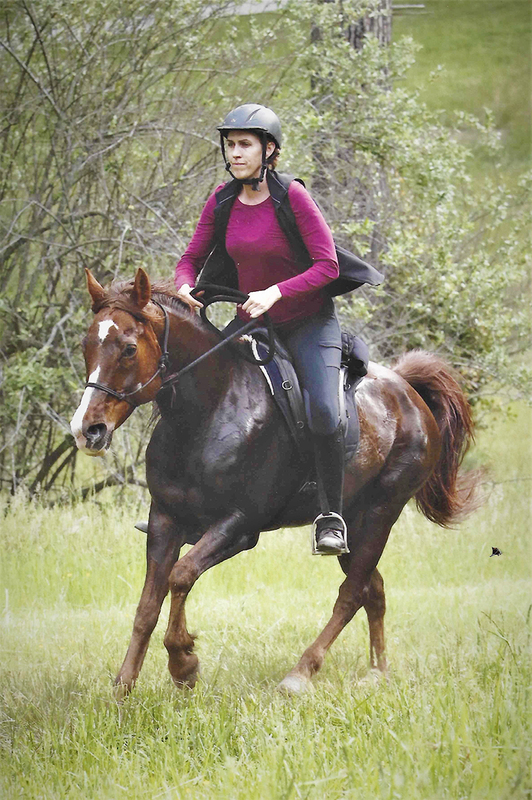 After riding in the Freeform for about 6 months, I noticed that my little trail horse was becoming very fun and forward. She never seemed to tire and would often load herself in the trailer as if to say “hey, let’s go.” Well, it became obvious to me that Mo and I should try an endurance competition. Our first ride actually was a few years later (I hate it when life gets in the way of my fun) and it was hysterical, as I’m pretty sure I walked half of it. I don’t mean Mo walked and I sat on her, I mean I got off and walked alongside my horse because she was having a meltdown, with all those horses around her freaking out, or running down the trail. Every time I thought she was going to explode, I just quickly got off. That is another reason I love the freeform over other treeless saddles. I sit deep and tight in it, but when I get off, I can pop right out. And if I can’t find a downed tree when I go to mount again, no worries. I can mount from the ground in a Freeform with hardly a shift. And trust me, I think I got off and re-mounted at least a dozen times in that first competition! Since then, (7 seasons later!) I am still riding the same horse in the same saddle, and she has become solid and confident and I never get off anymore. And she just gets stronger and stronger every year. But my beloved saddle is well worn. I have rubbed through the leather under my leg, the stirrup leathers have been replaced and the girth billets have seen better days. I met Paulita at on endurance ride a few years ago when she was noticing my very beat up Freeform. (I took it as a compliment.) We discussed what I liked and didn’t like about it and she informed me that MANY improvements have been made since I bought my saddle (I had one of the first.) I discovered she did not live far from me so when I was ready this spring, I tossed Mo in the trailer and we went to Paulita’s to get some new gear! I love my new saddle! Paulita was so attentive to my horse and what she needed to be comfortable. And trust me, if Mo’s not happy, NO ONE is happy. I got a new pad and saddle, and she was right, the improvements on the saddle are great. I feel like it fits my leg so much better and I feel so secure. This wasn’t my big concern on Mo, who I always feel confident on these days, but her son turns 3 this summer so I will be riding a green horse again! My aging body will be happy to have every advantage it can get! So out of either an abundance of caution or superstition (you decide), I chose to ride in my old saddle with the new pad at the Biltmore Challenge this year – pictured above. I plan to race in the new saddle next season after training in it this season. But I’m not ready for change at a race yet. So at the age of 18, Mo took first in the 30 mile race with her 2 trail buddies. Yep, we decided on a 3 way tie about 2/3 of the way through. I think the race management was not expecting that, and the next rider was 18 minutes behind us! Mo was the only horse of the 3 winners in a Freeform but she was the smallest horse, carrying the heaviest rider. She was also the oldest horse. I contribute Mo’s long, fun, successful career as an endurance horse to two things. One, she has the right partner! lol We are in harmony when we ride and we understand and respect each other. Two, she is comfortable and able to use her body the way it was designed to be used! I really don’t think I would have a horse half as good as the one I have today had I not found the Freeform saddle for her. She would be grumpy, bumpy to ride, and I’m sure she wouldn’t be winning races at the Biltmore Estate!